I don't make it to Claire's often. I'm somewhat iffy on Claire's polishes. I've picked out some great colors, but usually their selection isn't great or the formula isn't up to par. The good thing about their polishes is they are usually on sale BOGO 50% off. Yel is holographic robin's egg blue. I can't get enough of holographic colors, so this one is definitely a unique variation of one. The holographic-ness isn't as prominent as in other brands, but it's enough to make statement. My only beef with this color is the formula. This was 3 coats and I still had patchy bald spots. The formula was very sheer. I also don't understand the name what is "Yel"? I don't have much else to say today. I'm not in the best of moods. This upcoming week is going to be difficult for me with my school work and other things going on. I'm looking forward to October 1st. It's kind of one of those weeks where you have some major thing going on, and doesn't feel like life goes on after that event. Do you get what I mean? It's like you're waiting for this doomsday and you can't think, plan, or be excited about anything else until it's over. I tend to make things out to be way worse than they are. I know this, but I can't help it :P. No worries, nothing serious is happening this week. It's just something that gives me a lot of anxiety when most people don't even give it a second thought. Anyways, I will try to remain a positive as possible on here. I was just at Claire's yesterday. As a matter of fact, I was walking into one when you texted me. :P I NEVER saw this. I must be blind? Its awesome. i haven't been able to find this color, it was clearanced, i believe. I am looking for a backup bottle, now I have hope that I will find one! This is VERY pretty! 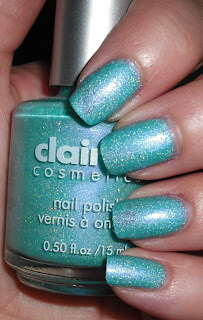 I haven't purchased a Claire's polish in YEARS! Thanks for sharing. I'm looking 4wd to OCT as well. I'd like Sept to be over already. LOL It will be here sooner than we think. Right? This is such a pretty color! I feel so uncomfortable in Claire's, but one day, I'm going to go. And I totally get what you mean by the whole Doomsday feeling. After it's over, I always feel slightly disoriented and a little empty...like I just walked underneath Niagara Falls. smdh. I'm sure everything will work out wonderfully for you though. Think happy thoughts! Sigh, we don't have a store here that carries Claire's. :( This color is lovely! Doll, I know EXACTLY what you mean! Hope all goes well & you're in my prayers. 2B Cool & 2B Hot colors in your stash - if you like holographic colors some of those are a must! I hate the fact that US Claire's seem to have names and all we have here are numbers no one is able to find! !